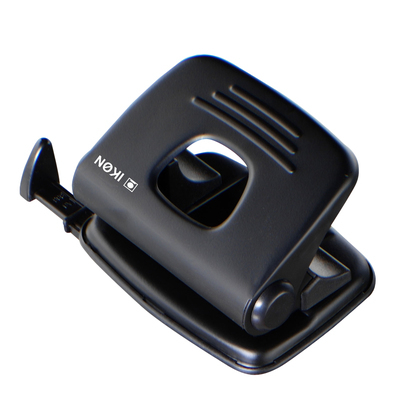 A vital piece of kit in any office or educational environment, our Hole Punch Medium Duty Black is an economical choice. Manufactured from a hard wearing and smooth black metal, this durable machine can effectively puncture two evenly spaced holes into up to 20 pieces of paper at one go. A measuring guide has been imprinted across the body, ensuring your holes are placed exactly centre while a handle lock down mechanism ensures safe storage. The curved design of the hole punch with ribbed detailing provides a comfortable resting place for your hands with anti-slip properties to avoid injury. Add to your stationery supplies with our wide range of products from Aluminium Pencil Sharpeners through to White Tack and Punched Clear Pockets.